Who has the cutest pet? You do when you have this adorable little hamster charm! With a 3-dimensional body carefully painted in tan and brown enamel, this super sweet CHARM IT! 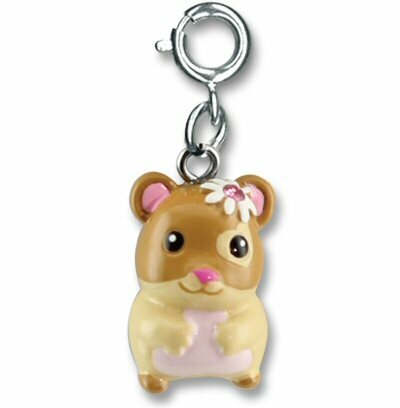 Hamster charm has a cute little face and a beautiful flower - complete with sparkly pink stone - on her head. The perfect pet and the perfect way to add personality to your own CHARM IT! jewelry, this fun hamster charm is a snap to attach. The cutest of kitties is ready for the catwalk in this CHARM IT! kitten charm. This pink and green CHARM IT! snail charm with a heart-covered shell likes to take it slow. Cuddly plush hamster Frolic has soft light brown fur, blushing cheeks, and sweet black eyes. This adorable little hamster Page Pal plush bookmark has a soft gray body, cream and peach accents, and a sweet face. This cute little plush hamster has soft tan fur, peach accents, a pink nose, wild whiskers, and a huggable body. This adorable hamster plush keychain has soft butterscotch fur, white and pink accents and smiling embroidered face.